I ran across the field in my nightgown to Damon who was leaving in the carrage. Stefan was right behind me. I ran right into Damons arms. "No Dami! Please don&apos;t leave me and Stefan alone!!" Stefan caugt up to me and Hugged Damon too. Damon put one arm around Stefan and one around me. 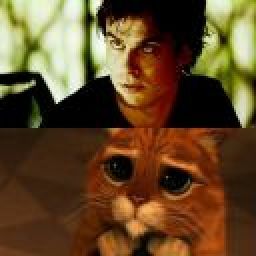 "Don&apos;t leave Damon!!" Damon siged and I saw a tear roll down his cheek. He looked at Stefan and said somthing. Stefan nodded. Damon got on his knees and looked at me at eye level. "Lizzie, I&apos;ll be back in three months. Can you wait that long?" I hiccuped. "H-how long is that?" Another tear rolled down his cheek he gave a sad smile. "Not very long at all." I hiccuped again. Damon wiped a tear from my face. "We can write each other letters. I promise it won&apos;t seem that long. I love you Piccolo." He kissed my head and hugged me. "I love you too. Bye Dami." He kissed my head one last time. and walked to Stefan. They hugged and Damon held Stefan at an arms length. "Prendersi cura della nostra piccola sorella di Stef." Take care of our little sister Stefan. "lo Damon. Promentto lo faro." I will Damon, I promise I will. Damon said bye one more time and got into the carrage Stefan wraped his arms around me and we watched him ride away. "H-how long is that?" Another tear rolled down my cheek. I gave a sad smile. "Not very long at all." Lizzie hiccuped again. I wiped a tear from her face. "We can write each other letters. I promise it won&apos;t seem that long. I love you Piccolo." I kissed her head and hugged her. I knew it would seem long. I just wanted to make my little sister feel better. I couldn&apos;t stand seeing my Piccolo upset. "I love you too. Bye Dami." I kissed her head one last time and walked to Stefan. I hugged him and held him at an arms length. "lo Damon. Promentto lo faro." I will Damon, I promise I will. I said bye one more time and got into the carrage. Its been two weeks since you left. I miss you alot. Stefan and I ride horses and play in the garden. And when he goes to School I have nothing to do at all exept help the maids. My nightmares have gotten a little better. I don&apos;t wake up screaming anymore. But I do cry untill Stefan comes. He usualy just knows when they happen.